There is so much good content in the backposts. I thought this post by Edyth deserves reposting. While there are no rules, there can still be guide lines. A good general one is to make the doll about four times as tall as the shoulder head. Immediately we can think of dolls that will not fit the proportions given here. A late china head may have a very shallow shoulder. A fine early china may have a much deeper shoulder for the size of her face. An early papier mache so called milliner’s model will be taller than this one to four norm. 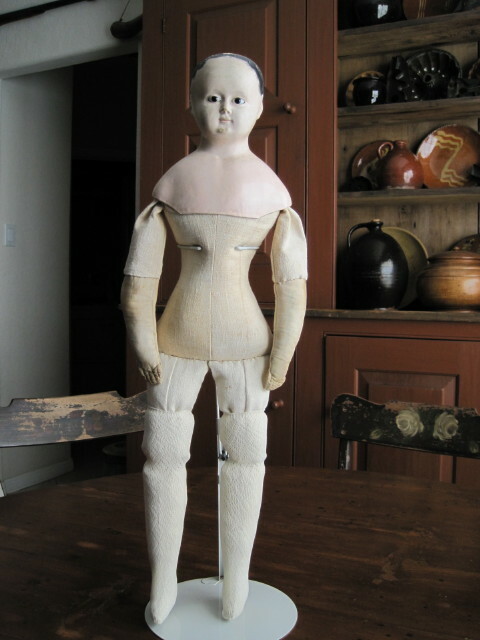 Many early dolls are elongated in this way. To make one longer yielded a doll which was effectively larger for a given size head. 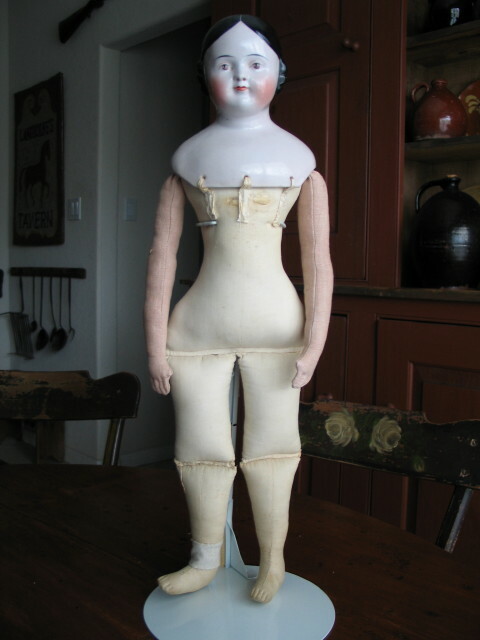 At the end of the 19th century the patent washables were also made longer in proportion to the shoulder head size, to have a bigger doll to sell and increase the price. 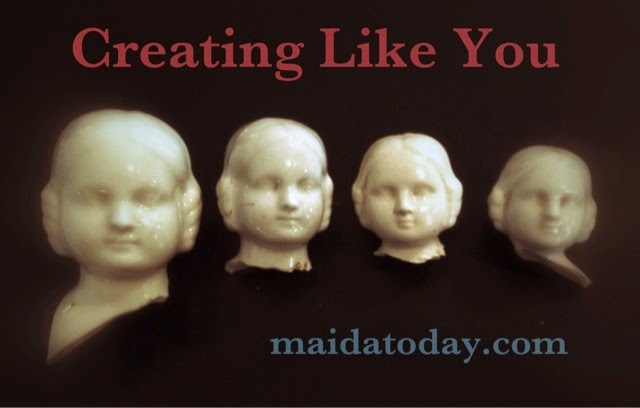 Now that we have noted a lot of the dolls that refuse to conform, here are some of the guidelines I use when I am making a body for an antique head, or selecting an old replacement body. A pink tinted china covered wagon style on a vintage but not antique body, needed arms when I found her. The tan linen I used for the arms is more pleasing than a white or cream fabric for this deeply colored china head. The china doll head is 6 inches tall. The one to four ratio tells us she will be 24 inches tall. The bend of her lap will be about half way or at the 11 ½ inch to 12 inch mark. Her arms will hang low enough to extend below this bend. A glass eyed papier mache head has a new body made by me except for her original fabric hands which were salvaged. For the body of old Pennsylvania homespun sheeting I made for this papier mache head, I used similar proportions, and hand stitched the replacement stockings above the knee bend. The bend of the knee is a bit less than half the length of the leg. Learning to make these simple cloth bodies is a tremendous help for a doll collector. Yes we had all rather collect early dolls with original clothing on perfect original bodies, however finding lovely old doll heads is a great way to have a nice collection at a modest cost. "How do I create unique creations from my perspective while being inspired by antique dolls?" The purpose of this series of prompts is to discover your own unique style through studying favorite antique dolls. For many of us, a way to do this is to try on the styles of doll makers who have come before. When we want to try and copy an antique doll, it is because there is something IN us that the doll speaks to. So, choose 5-8 favorite antique type dolls and describe each of them. 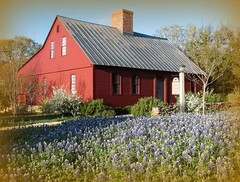 Materials used: One of a Kind, Cottage Industry, Factory Made? Now, once you have evaluated each doll using the questions above, take note of what they have in common. Which words came up more than once? Make a list of those and tuck that list away.